During the 29 years that Elvis Presley made his home in Memphis, he lived at a grand total of nine different addresses. Today, some of these addresses are nothing more than empty lots but at some, Elvis' former homes still stand. On the pages ahead, see these addresses and how they look today. Elvis and his family moved into a boarding house at 370 Washington Street in 1948. This was the family's first home in Memphis. Today this address is nothing more than an empty lot with overgrown weeds and a chainlink fence. The Presleys moved into another boarding house at 572 Poplar in 1949. Their rent was reportedly less than $10 per week. Now this address is a parking lot adjacent to a downtown business. The Presleys moved into their Lauderdale Courts apartment on Winchester Avenue in 1949. Lauderdale Courts was a low-income housing project and the Presley's paid $35 per month in rent. They lived there until 1952 when their income exceeded the maximum amount allowed. This apartment can now be rented for the night for fans who want to sleep where Elvis did. When the Presleys lost their low-income housing, they moved into a rooming house at 698 Saffarans where they stayed for the next few months. Today that house is gone and there is an empty lot where it once stood. Elvis and his family moved into an apartment at 462 Alabama in 1953. It was right across the street from Lauderdale Courts and they lived there until 1955. Now, as you can see from the photo, there is an interstate where the home once stood. The Presleys lived in this home at 2414 Lamar for a few months in 1955. Though the home still stands, it is no longer a private residence but a business. This home at 1414 Getwell was the last of the rentals for the Presley family. They lived here from September 1955 until March 1956 and reportedly paid a rent of $85 per month. This location is now a business in a strip of shops on Getwell. Elvis bought this house at 1034 Audubon for his family in 1956 for $29,000. They lived there for just one year when Elvis bought Graceland due to an increasing need for privacy. 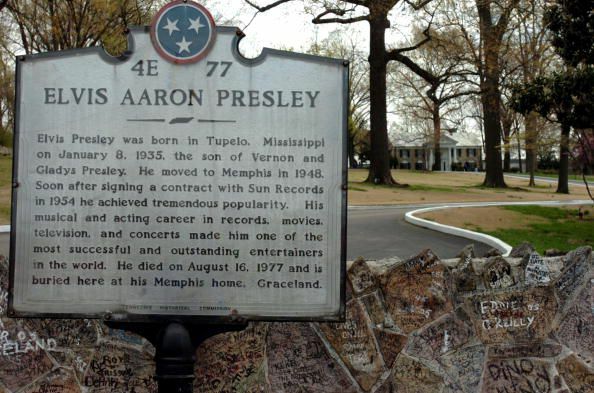 The house still stands today and has had eight owners since the Presley's lived there. Elvis bought Graceland in 1957 for $102,000 from Ruth Brown Moore. The purchase price included "trading" in his Audubon Drive house. Graceland was Elvis' final home in Memphis and is where he died in 1977.